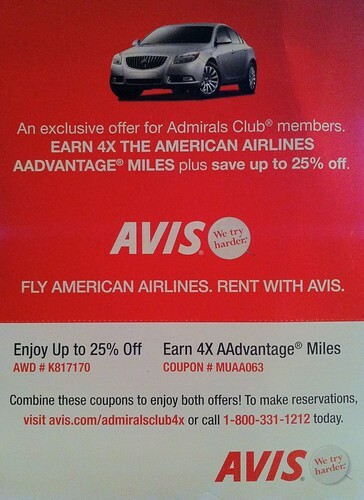 I was at the Admirals Club the other day and noticed a countertop advertising stand with a 4X AAdvantage Miles offer from Avis. You won’t find mention of it on AA’s website or at Avis.com, and it’s marketed as an “Exclusive Offer for Admirals Club Members” but nowhere in the terms and conditions does it mention that a membership is required. • Now through August 31, 2012, American Airlines AAdvantage members can earn quadruple AAdvantage miles on rentals of 1 or more days at participating airport locations in the U.S. and Canada. • Use coupon # MUAA063 and provide your AAdvantage number at the time of reservation or at the rental counter to earn your AAdvantage bonus miles. Quadruple AAdvantage miles are calculated using your AAdvantage base miles multiplied by four for every day you rent with Avis. • This offer is in addition to your everyday savings of up to 25% when you use AWD # K817170. • Quadruple American Airlines AAdvantage miles valid on a qualifying rental of one or more consecutive days at participating Avis airport locations in the U.S. and Canada. • Offer of quadruple AAdvantage miles is valid on daily and weekend rentals. • Mention coupon MUAA063 to get this offer. • Quadruple AAdvantage miles equal 200 AAdvantage miles per rental day. • Offer valid on all car groups. • An advance reservation is required. • Offer may not be used with any other coupon, promotion or offer except your AWD discount. • The savings of up to 25% applies to the time-and-mileage charges only. • Use AWD K817170 to receive this discount. • Taxes, concession recovery fees, vehicle license recovery fee, customer facility charges ($10/contract in CA) and fuel charges are extra. • Optional items such as LDW ($35.99/day or less) and other surcharges may apply and are extra. • Offer is subject to vehicle availability at the time of rental and may not be available on some rates at some times, including some online rates at Avis.com. • Car rental return restrictions may apply. • Offer subject to change without notice. • Holiday and other blackout periods may apply. • Renter must meet Avis age, driver and credit requirements. Minimum rental age may vary by location. An additional daily surcharge may apply for renters under 25 years old. • Rental must begin by August 31, 2012. There’s another offer from Avis of 1,500 AAdvantage Miles for a 3 day rental, which is a better deal if you’re renting for 3 to 7 days. Single, 2 day, and 8 day rentals will be better off with the 4X miles. Want the scoop on the best ways to maximize your AAdvantage membership? Read these top tips submitted by AAdvantage members like you! Got a tip to share? Submit your tip now through 5/1 and you’ll be entered for a chance to win 5,000 AAdvantage miles. On or around 5/23, we’ll select our 10 favorite tips to win. There’s even a blogger component to the promotion: five bloggers (including me) were asked to offer their favorite AAdvantage tip. Here are the details: the blogger with the tip that gets the most votes will win 5,000 AAdvantage Miles for themselves and 5,000 AAdvantage miles to give away in a reader contest of some kind (for the record, if I win I’ll donate my 5,000 miles to AA’s Miles for Kids program). I’m flattered that I was asked to take part in a promotion with The Frugal Travel Guy, The Weekly Flyer from Points, Miles & Martinis, Mommy Points, and Matt Long at Landlopers, so this is pretty exciting to me. There are lots of good suggestions on the AAdvantage Facebook pages, so go read them, submit your own AAdvantage tip, and vote for your favorite expert advice (look for the “Expert Tips” tab)!